Harajuku teen wearing vintage tops, camouflage print shorts, and black platform boots. Harajuku girl in a faux fur hat, deconstructed graphic coat, platform snakeskin boots, and floral crossbody bag. 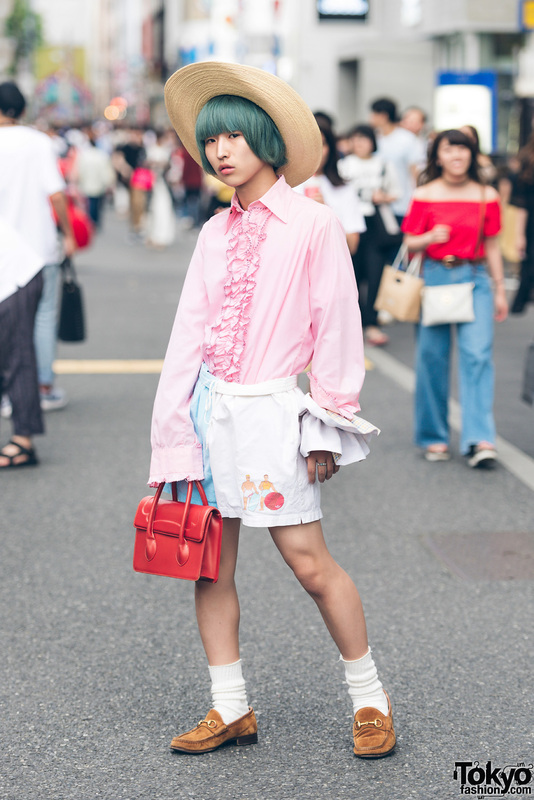 Harajuku aqua-haired student wearing a vintage ruffle shirt, drawstring shorts, white socks, loafers, a red handbag, and a wide brim hat. Harajuku girl sporting a red ensemble with a sports jersey, shorts, platform sneakers, cute backpack, a visor, and accessories.